Consult the following specialized catalogs to find materials not included in the general catalog. Clarence provides detailed information on the newspaper holdings in the newspaper collection of the American Antiquarian Society. 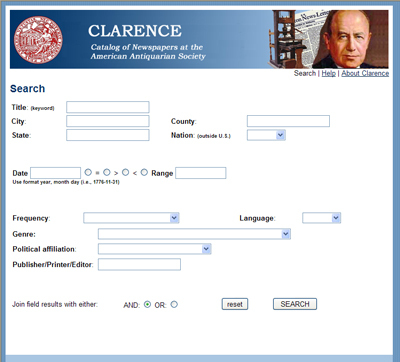 At this time Clarence contains holdings information for roughly 75% of the newspaper issues in the collection. Inputting the holdings data for the entire collection is ongoing. Clarence does not provide digital images of the newspapers. In order to provide digital access to a portion of its newspaper collection, the American Antiquarian Society has partnered with Readex, a division of NewsBank, to create America's Historical Newspapers. This collection of fully-searchable, digitized, historical American newspapers contains nearly 2,000 titles from all 50 states. Clarence is named in honor of Clarence S. Brigham (1877-1963), a man pivotal in the building of the AAS newspaper collection. Brigham began his service to AAS in 1908 as its librarian and retired in 1959 as its director. His monumental History and Bibliography of American Newspapers, 1690-1820, listing over 2,000 titles, was first published in 1947. A union catalogue, the Catalogue of American Engravings describes engravings issued as separate publications or as illustrations in books and periodicals from the early eighteenth century through the year 1820. Included are portraits, views, political cartoons, and illustrations covering many subjects and genres. Excluded are maps and ephemera, such as bookplates, billheads, trade cards, and currency. Approximately 85 percent of the holdings are at AAS. Graphic Interface of Gathered Images, or GIGI: The AAS Digital Image Archive, is the American Antiquarian Society’s Digital Assets Management system. Collected in this image archive are representatives from all of the Society’s curatorial collections including manuscripts, rare books, children’s books, graphic arts (including prints and fine arts), newspapers and periodicals. The system was implemented in April of 2011 and GIGI now boasts and impressive 50,000+ items, many of them with metadata fields (title, author, date and description) attached to the files enabling ease of browsing and searching. The number of items is being added to weekly. It is named in honor of the Society’s former Curator of Graphic Arts, Georgia (Gigi) Barnhill. Based upon the unparalleled collection of Children's Literature held at the American Antiquarian Society, this 19th Century American Children's Book Trade Directory contains 2,600 entries documenting the activity of individuals and firms involved in the manufacture and distribution of children's books in the United States chiefly between 1821 and 1876. Nationally known firms such as McLoughlin Bros. and non-profit publishers like the American Sunday-School Union are included, as well as prominent educational pioneers such as Elizabeth Palmer Peabody, Samuel Griswold Goodrich, and William Bentley Fowle. The directory also reflects the dynamic growth of children's book production in the major publishing centers of Boston, New York, and Philadelphia--as well as in regional markets such as Rochester, Mobile, Atlanta, Cincinnati, and San Francisco. In short, the Directory documents both a book industry and an American children's literature that are coming of age in the midst of stunning technological advances, sweeping social change, and great economic upheaval. Entries can be searched by: Heading (name of person or firm), Street address, City, State (two-digit postal code), Country (countries outside of the United States; used to document people/firms operating in both the United States and another country such as England); Chronological Date Range of Street Addresses; Role, and Notes.